Miss Vanda, wanting to be happy and fulfilled, she sets on a self-discovery mission. 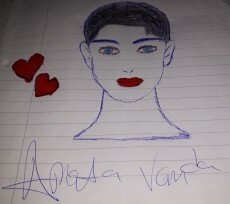 I'm Amata Vanda and welcome to my life. Let me rewind back 7 years earlier when I was at the age of 17 and working as a young secretary and as a secretary, my duties were to answer phone calls, maintaining files and scheduling appointments. My favorite part of my job was being able to work effectively with and meeting many different individuals. I learned from every single person that I met and over time I developed a strong relationship and an ability to communicate with the people I worked with. But I sure wasn't prepared for the transition I was about to face in my life. Everything was just so new, new friends and a new city. (After My family and I moved from the east-side of Riverlake to Kortcity and although it was extremely tough at first, time flew by really fast and I learned to adjust to the new changes. The people we met here are super amazing and have helped my family and me tremendously. And after five months of living in our community, I developed a love for fashion because my mother was a designer, and hosted lots of fashion shows for children and young adults. But sadly, my mother died of natural causes. I was so devastated by the grief of mama’s death such an unbearably intense feeling. But after my mom's funeral, I moved in with my aunt Bee and her husband Zen to cope with the loss of my mother's death. My family and I were very close, and I always tried to keep that perfect balance between my job and my loved ones. Oh lord, I've kept this act for so long, I just don't know how much longer I can do this. Being raised in a Christian home, and growing up differently from the rest of the "regular kids" out there. I've never felt so close to anyone to tell them exactly what goes on in my mind/ life. It was a beautiful summer day in August with the sky oh so blue, and as we sat on our balcony looking at the lonely road. Aunt Bee who I drew closer to overtime began questioning me out of curiosity about my love life, and why I wasn't dating yet. She added '' Child, you are beautiful, smart, compassionate and with unique qualities and personality. I don’t know where to go anymore. And take my breath away. And blue for the sky is the limit for us. After few weeks Jeremiah and I then hosted our engagement party by bringing people together and celebrating our love for each other. His family smiled, made a toast and then welcomed me to the family. I, of course, was in shock because I had previously written in my diary book '' Dear diary, am I going insane for thinking that this man family doesn't like me? That they think I'm marrying him for citizenship? And few of his friends have even asked him what my intention is for wanting to marry him. I have talked with these people before, but it did not really feel like I was talking to them, does that make senses? Oh, dear Diary, They weren't really interested in talking to me’’ I know I came to this country as a tourist on a journey to become a storyteller. But I sure wasn't looking for love, no expectations at all until I met Jeremiah and although I noticed some changes in his behavior I had two choices I was contemplating to either stay or walk away from what we had already built together but I knew he was somehow being brainwashed and voiced over by his family.
'' I have had multiple partners, but I have never been loved the way that you love me, Amata. I secretly question your intention at times not because I think you are a bad person, but when a man finds a woman that loves him deeply his whole world becomes a dream. I want to build a life and a family with you. I want to go on dates and adventures with you, Amata. I deeply love you.'' I happily said: God knows I love you, Jeremiah. I truly cannot express the love I have for you; you have made me the happiest girl in the world. But my suggestion, Jeremiah. And please don't get me wrong, I want us to postpone our wedding because we both need time to find ourselves. I want us to walk down the aisle with our hearts and not our mind and give ourselves to each other before our God. I want to be speechless and emotional when I stand with the man I love so much. Having quality time alone is to reevaluate our relationship and for our own well-being, learning more about ourselves and our desires. Jeremiah replied: Needing a break from a relationship always leads to a breakup. I promised him that it wasn’t my intention to break off the wedding, but I needed a holiday with my inner self and that I was planning to go back to Kortcity( It's all about staying true to who I was) I felt something was calling me home, I didn't know why, and my ability to think straight was impossible, but I had a strong feeling of traveling to Kortcity early Thursday morning. I later told Jeremiah that I have been considering seeking a * paused* psychologist for emotional difficulties… He looked at me with tears in his eyes and just hugged me tightly and kissed me on the cheek. © Copyright 2019 Missy1920. All rights reserved. mine too and leave a comment about anything you don't like.